I got an Italjet before I went to school and drove it like hell on my grandfather's farm. The cover over the exhaust was missing and I got regular inside leg burns due to that. On the occasion I also forgot the side stand down and bought a few farms - nerwe af on the knees. My grandfather (in his boredom and without my grandma's knowledge) thought it wise to make a ramp for me using a long narrow piece of wood and a few bricks for elevation. After I exhausted the capacity of the ramp's jump distance (his boredom) he called a few of the farmworkers kids and had them lay down in front of the ramp. After he was satisfied I could clear the kids nicely on close spacings, he spaced them out further and further until my grandma came across our little spectacle and put a stop to it. I felt like a daredevil at age 5! Geez, we got hell from the old woman. My introduction to "Dual Sport" was the Yamaha MR-50. I bought it second hand from a school mate for a princely sum of R 50 in 1987. Petrol was freakin' cheap then. I once put in 18 cents and got quite a bit of juice. I heat seized the thing once while trying to do 110 km on the Freeway. I am not sure what happened to it after I left college. By that time it was stripped in pieces. Favourite memory of this bike: Riding home pissed from the Brass Bell in Kalk Bay. Now that I think of it it was not very responsible. I'm not sure if this qualifies as my first bike. A Honda Express 50cc/2 speed automatic. It was actualy my mom's. I grew up on an Air Force base in the early 80's (Langebaanweg) and there were stacks of these things all over the place. I used to ride in the garden and sometimes sneak out in the street. It had a 2l tank and could get a top speed of about 40 km/h. That's fast when you're a laaitie. Had lots of fun on that thing. Yamaha DT 125. This isn't my bike, but mine was identical. Used to fill up with R0.50 petrol and ride to varsity and back several times before refueling. Rode it for about 2 yrs without a licence. The first time I rode it I wheelied unintentionally through the UPE security entrance, being unaware there was a power band. I think it had a 2T oil reservoir instead of premixing. Yep, that 2 smoke power band.... First time I rode my friends PE 175 in the sand dunes I kakked myself. I wasn't expecting the power band. Try riding a old Vespa scooter in the dunes. Lank fun! I had one of these in the 80's. It started life like the pic and later looked like a plastic as all the lights and roadworthy parts were broken / crashed. 1976 Yamaha YB80. Had it for four years and did quite a few trips on it, the longest from PE to Stellenbosh over two days, because I needed it there in my student days, and my father would not pay to put it on the train. Also had an MR-50, epic go anywhere do anything bike. En die een was myne. 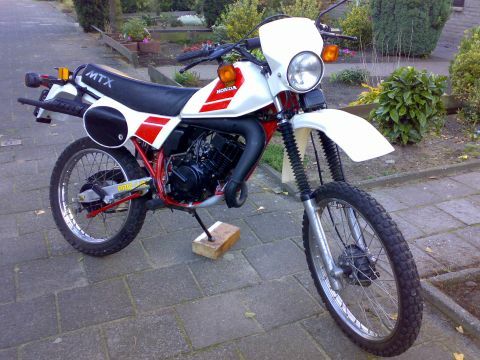 1986 Honda MTX 50. Stadigste bike op die dorp, maar hy het my oral gevat waar ek wou wees. 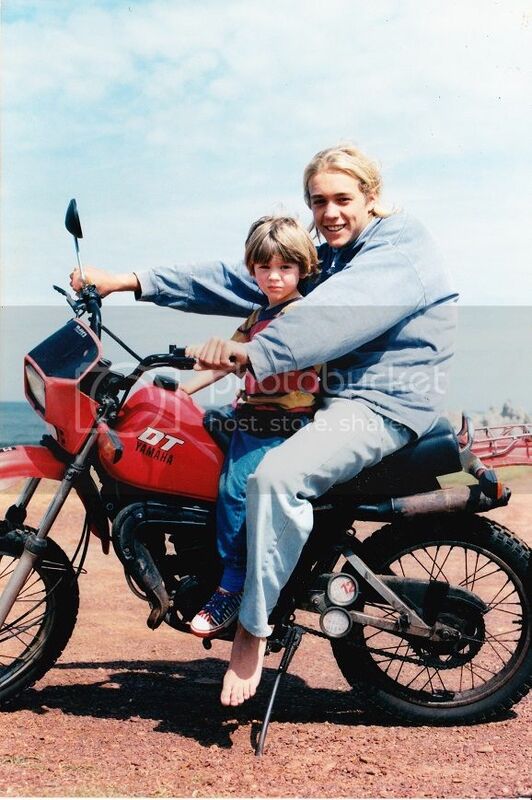 This was my first bike, in 1999, A 1995 Kawasaki ZX-6R. Bought it for R35 000 (borrowed from Wesbank ) Learnt to ride it by wobbling from Linex Yamaha to Burchmores where I worked in 4pm traffic. Crashed it 5 days later on the corner right by my house and really trashed my knee and hands. Whats ATGATT? Ek ken die gevoel - was great om op so n jong ouderdom al te kon bike.